Weight (w/o passengers): 54,300 lb. + The propulsion package, while capable of higher speeds, is limited by the logic of the car controls and the external signal system. By the mid 1970s, the last of the 4000-series cars were approaching the time for retirement, but the minimum service requirements could only barely be covered by the remaining 2000s, 2200s and 6000s, and even the latter series was beginning to show its age. Gaining from the experience of 330 cars of the 2000- and 2200-series, CTA ordered 100 new cars with an option for an additional 100 (which was eventually exercised) compatible with the 2000- and 2000-series. These cars, the 2400-series, feature interior and exterior esthetic design by Sundberg-Ferar, the design consultant retained by Bay Area Rapid Transit (BART), Metropolitan Atlanta Rapid Transit Authority (MARTA), Washington Metropolitan Area Transit Authority (Metro) and Boeing-Vertol. Built by Boeing-Vertol, these cars feature smooth curved, stainless steel exteriors and contoured fiberglass front ends (a featured pioneered by the Pullman 2000s, but discarded in the 2200s). The interiors of these cars feature fiberglass seats with padded inserts, walnut grain wainscot panels, and brown floors. These cars are notable as the first cars built for the "L" in over 50 years to have sliding instead of the blinker-type doors. This gives a wide opening more suitable for access by handicapped persons. The cab was dedicated to the motorman's use only from the onset; rearranged equipment and a better seat for the motorman are two of the benefits gained. (Many who remember the pre-2400 series cars recall the open cabs as the bests seat in the train.) The electrical equipment is generally the same as that of the 2200-series. The major exception to this is the use of a motor-alternator to supply 230-volt 60-hertz power for all the auxiliary motors on the car. Low-voltage DC is provided by transformers and rectifiers for the control system. Use of 60-hertz AC allows less expensive components to be employed in place costly, high-maintenance DC equipment. Cars 2491-2500 were planned to be delivered with advanced, solid-state propulsion control with regenerative as well as dynamic braking, though only 2491-2492 were actually delivered with such a package. The solid state (chopper) control was expected to provide smoother acceleration and braking, as well as power savings as much as 30% by utilizing regenerative braking. Following extensive testing with the 2491-2492, the decision was made to change the control on all 10 cars to the conventional cam package. Prototype testing had revealed unanticipated electromagnetic interference, which could have affected the signal track circuits. Cars 2491-2492 were returned to the builder for this conversion. The other eight cars had the conversion performed before they were ever delivered to CTA . 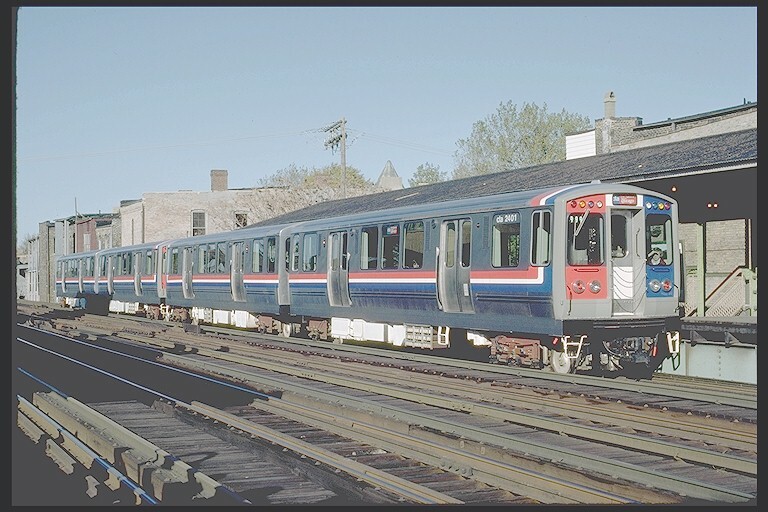 Between 1987 ad 1995, the 2400-series cars underwent their mid-life rehab, performed in-house by Skokie Shops personnel instead of contracting the job out. Cars 2401-2422 have been retrofit into work-capable motors -- distinguishable by their red and white belt rail and candy-stripped ends -- though these cars still run in passenger service as well. In additional to the noticeable livery change, they also received a series of not-so-noticeable changes. The control group wiring on the cars was upgraded using a larger diameter wire. Resisters have been relocated out of the control group, allowing larger ones to be used; they are now located under the car, next to the grid resistors. A plug for passing the 600v DC current to work cars has been located next to the coupler. Longer trolley beams are used on both sides of both trucks, allowing sleet scrappers to be installed next to the third rail shoes. The cars can also accept de-icer installations. 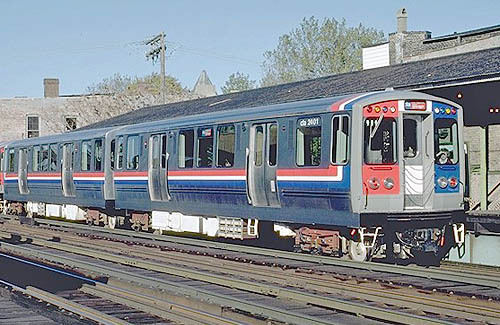 The first converted cars, 2409-2410, were released from Skokie Shops on March 7, 1995, with the remainder of the cars completed by late summer. Initially, the cars were used in passenger service on the Red Line, then all 22 operated on the Green Line, sometimes in solid six-car trains. Later, cars 2423-2424 were also modified to serve as work motors. Currently, the work motor-capable 2400s are split between the Green and Purple lines, putting some work motors in various parts of the system to allow work trains to be more easily dispatched from different yards. By the late-1990s, all the "L"lines had been converted to one-person operation. Thus, the half-width cabs that were on the 2400-series (and all other cars, except the 3200s) became ill-suited to this new type of operation. The 2600-series cars began to receive them quickly, but the 2400s are being more slowly converted. The first test installation of a full-width cab in the 2400s was performed on units 2531-2532 and 2579-2580. Additional cars have been retrofit as well, but the work is far from complete on the series as a whole. The cars have spent time around most of the system since their delivery in 1976-78, but by the late 1990s the cars were used to entirely equip the Green Line and provide a sizable portion of the Purple Line's roster as well. A number of cars were also assigned to the Red Line in the 1990's, but by late October 2000 the cars were entirely assigned to the Green and Purple lines. Beginning in Fall 2003, the 2400-series railcars began losing their red, white, and blue belt rail striping, as well as the red and blue panels on their sculpted end caps. The last cars on the system to sport any traces of color, save for the occasional ad-wrapped car, this project brought the 2400s' aesthetic into synch with the rest of the passenger fleet, including the aforementioned rehabbed 2600s and the as-built stainless exteriors of the 2200s and 3200s. Besides making the entire fleet visually compatible, lending itself to appear more coherent and integrated, the elimination of these features will also allow some mild reductions in maintenance costs. Although the end caps rarely need touching up -- the color there is not paint, but rather a type of gel coating that adheres to the molded plastic -- the belt rails are often decimated when graffiti remover is used on them, making a reapplication necessary. Many that aren't damaged by the acidic cleaner are in poor shape from sun bleaching and "alligatoring" due to their age (the current belt rail style was introduced circa the early 1990s). Removing this visual touch will eliminate the need to reapply the decals. The only 2400s whose end caps will not be completely gray are the 22 work motor-equipped units, cars 2401-2424, which will get to keep their reflective candy-stripped panels. However, they will have their red and white belt rails removed. The CTA's 2002-2006 and 2003-2007 capital improvement plans included a $16,000,000 program to test new technology on up to eight modified 2400-series rapid transit cars. In order for CTA to develop specifications for a new family of rail cars, it was proposed that up to eight 2400-series cars be modified to accept new state-of-the-art subsystems, including AC-propulsion systems. By using the modified 2400-series cars as a test bed for new technology, CTA wanted to assess the integrated performance of these subsystems and their subsequent use in future rail car purchases. A similar test of technologies was done with a few 6000-series cars in the 1950s to test new developments for what was then the next generation of cars, the High-Performance 2000-series cars. However, it now seems that this program was canceled and the designated money spent elsewhere. The 2002-2006 CIP also provided for the replacement of the 2400-series rail cars. The 2400-series have been in service over 25 years, which is approaching their intended design life. The deteriorated condition of these vehicles is evidenced in the form of increased service failures and longer repair downtime, which results in decreased availability for service. Replacement of these rail cars will provide the CTA with modern updated vehicles that will decrease maintenance and operating costs while enhancing rider comfort. The CTA does not currently have funds to replace all 200 2400-series cars; Illinois FIRST funds the CTA has allocated for 150 new cars will only over the replacement of the 2200s. This would not provide for an increase in the CTA's fleet size which will be required when the Brown Line's capacity is expanded to include 8-car trains. The number of cars to be purchased will be determined by a 2002 assessment of future rail car procurement, schedule and maintenance requirements. Beginning in spring 2004, the CTA began to overhaul the 2400-series rail cars as part of a life-extending rehabilitation. The need to overhaul these cars and keep them in active service is brought on, in part, by not being able to take delivery of new cars until 2006 at the earliest. All 2400-series rail cars will receive overhauled cam control groups, which are the heart of the propulsion system and provide for smoother acceleration and braking. The 2400-series rail cars will have master controllers rebuilt, a heavy inspection of trucks, upgrade of door units and upgrade of the friction brake hydraulic pump control units. The "L" gained another "mis-mated" unit in May 2006, when cars 2469 and 2504 were joined in what became the second non-consecutively numbered pair in the 2400-series. Car 2503 was decoupled from its mate and removed from service due to a leaky roof. Its mate, 2504, was paired with car 2469, which had been moved to Linden Shops on February 24, 2006 and served as a training car for maintenance staff. Car 2469's mate was severely damaged in a fire at 37th Middle Track on the Green Line exactly one year earlier, on February 24, 2005, and would likely never return to service. Car 2503 took 2469's place at Linden. Car 2469 was shipped from Linden Shop to Skokie Shops on May 5, 2006 to be re-mated. The new married pair 2469-2504 officially joined the fleet roster, assigned to the Green Line, effective May 24, 2006. In 2012, with the continuing delivery of the new 5000-series cars and their assignment to the Green Line, the 2400-series cars again began to be assigned to Red Line service. The reassignment kept to CTA's preferred method of car assignment to minimize the number of different series assigned to a terminal (to allow for more efficient and economical maintenance and parts stocking), since a number of 2400's were already assigned out of Howard for Purple Line service. The moves also served the dual purpose of freeing up some Red Line-assigned 2600-series cars to go to the Blue Line (to replace 2200-series cars being retired) as well as to increase the total number of cars assigned to the Red Line to provide a larger spare ratio. 2400-series cars began to be assigned to the Orange Line at the end of October 2012. Rather than replacing 3200s assigned to the line, the 2400s supplemented the fleet and increased the line's car count. The intent was to use them on additional Brown Line runs scheduled to originate from Midway Yard beginning December 16, 2012, and as such the 2400s were chosen because it would limit the use of the 36-year old cars to rush periods. However, the cars occasionally found their way onto Orange Line trips as well. The 2400s are the first type to be permanently assigned to the line other than the 3200-series type the line opened with in 1993. While a few 2400-series cars were retired just a couple years into their service lives due to the fire at 61st Yard in 1979, 194 of the 200 cars built remained in service into the 21st century. With the delivery of production units of the new 5000-series cars beginning in 2011, and accelerating in 2012, the CTA began retiring the 2200-series cars, the oldest in service at the time. Reaching 37 years of service before the series' retirement began, cars began to be retired in earnest in August 2013 following the retirement of the last 2200-series cars. Retirement of the 2400s went quickly, as manufacture of the 5000s was well underway by that time and had become a smoother process, providing deliveries of new cars at a quick pace. Only 15 months after the last 2200s were retired, the last 2400-series cars were removed from scheduled passenger service. While they were mainstays of services like the West-South Route, West-Northwest Route and Ravenswood in early years, and the Red, Purple and Green lines in later years, interestingly enough the last 2400s were retired from the Orange Line, a route they never ran on before until 2012. Last trip of 2400-series in scheduled revenue service was Friday morning, October 31. 2014 (coincidentally, on the anniversary of the opening of the Orange Line, where they last ran). The last trip was Run 707, which arrived back at Midway at 1021 hours with a consist of cars 2508-2507-2581-2582-2449-2450-2511-2512. Following its arrival at Midway, the train was laid up at Midway Yard, with the 2400s thereafter out of daily service. Even with cars being retired and scrapped, the 2400s would not all disappear from the "L" for a while longer, however. The 24 cars that were modified for work motor service, cars 2401-2424, identifiable by their reflective red and white side stripes and front end panels, are being retained for the time being. They are planned to be used only in work service and not in passenger service, although they will likely be kept in a condition such that they could be used for passenger service if necessary (the 5-50 series cars were similarly kept in their final years). Over the years a few 2400s have been retired, typically due to damage from an accident or other mishap. The remainder began to be retired in 2013. The first unit sent to scrap as part of the end-of-life retirement was cars 2491-2492. Excerpts from this car history are from Chicago's Rapid Transit, Volume II: Rolling Stock 1947-1976 by the Central Electric Railfans Association. Copyright 1976, CERA. All right reserved.